If you have been forwarded here from http://www.surprisedbybeauty.org, bear with us: the Surprised by Beauty website is being planned and built. Until ready, the URL links to this review. 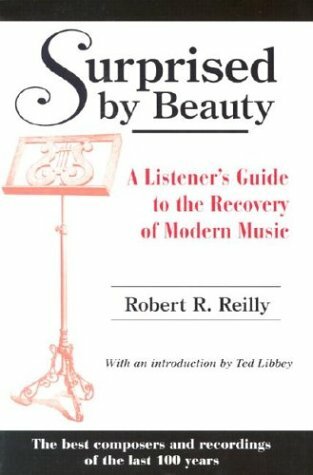 Robert Reilly's Surprised by Beauty: A Listener's Guide to the Recovery of Modern Music has been with me since its publication. It is one of the most heavily bookmarked, annotated books I have, and much cherished. In the interest of full disclosure, I readily admit that I had the immense pleasure of getting to know its author and critiqued this book twice; once preemptively, before its publication, and again in a tome of a letter, unsent, still. This book is not perfect, and it is probably not first-order brilliant either, but it is beautiful! I treasure it as much as I treasure much of the music that I have since enjoyed because of it. Robert Reilly has the unusual and delightful ability to infect the reader with insatiable curiosity about the composers he champions. Names that often were unknown, and sometimes unpronounceable, suddenly seem totally fascinating and worthy of discovery at the earliest opportunity. Yet beyond this level of exploration is his personal vision of music as something profoundly spiritual, expressive of what is best and most enriching in human life and having the possibility of leading us to encounter God Himself. That is a good introduction to Surprised by Beauty. The opening quote of the book is from Max Picard: "[In] sound itself, there is a readiness to be ordered by the spirit, and this is seen at its most sublime in music." The love for music never ceases to impress, and as knowledgeable a man as Mr. Reilly is always a pleasure to have along for instruction. Before I delve at some length into examples I (dis)agree with in this book, let me summarize. If you want loving introductions to the music of John Adams ("The Search for a Larger Harmony"), George Antheil ("Bad Boy Made Good"), Malcolm Arnold ("English Enigma"), Gerald Finzi ("Imitations of Immortality"), Stephen Gerber ("Keeping America Real"), Morton Gould ("Maestro of Americana"), Roy Harris ("Singing to America"), Vagn Holmboe ("The Music of Metaphysics"), László Lajtha ("Music from a Secret Room"), Gian Francesco Malipiero ("Beyond Italian Opera"), Frank Martin ("Guide to the Liturgical Year"), William Mathias ("Musical Incantations"), Carl Nielsen ("Music is Life"), Einojuhani Rautavaara ("New Northern Light"), Albert Roussel ("The Freedom of Personal Vision"), Edmund Rubbra ("On the Road to Emmaus"), Harald Saeverud ("A Norwegian Original"), Aulis Sallinen ("Scandinavian Consolation"), Peter Schickele ("Schickele Unmixed"), Franz Schmidt ("Setting the Apocalypse"), Alexander Tcherepnin ("From Russia With Love"), Eduard Tubin ("In From the Cold"), Geirr Tveitt ("The Music in the Waterfall"), Mieczyslaw Vainberg ("Light in the Dark"), Peteris Vasks ("Another New Northern Light"), as well as Duruflé, Elgar, Janáček, Martinů, Poulenc, Shostakovich, Sibelius, Vaughan-Williams, and Villa-Lobos—you have picked up the right book. These are the composers dealt with in little chapters, ordered alphabetically and cobbled together from reviews and pieces written in different magazines. Nonetheless, there is a coherent line through the work, culminating in a few interviews with composers such as Robert Craft, David Diamond, Gian Carlo Menotti, Einojuhani Rautavaara, George Rochberg, and Carl Rütti. Let me say it right away. As a lover of modern music—with a much higher tolerance for the unnecessarily absurd (Concerto for two cheese-graters, jet engine, electric toothbrush, and chromatic garbage disposal? Bring it on! )—I have grid (grinded?) ground my teeth many a time. A more conservative reader than me would find himself nodding along throughout the book. Either way, it is a veritable treasure trove. After every chapter, there is a little section discussing the merit of important works of that composer in different editions. This is immensely helpful in choosing where to start the musical discovery tour. In a chapter on Peter Schickele (whose program structured my Saturdays until it was, unfortunately, taken off WETA—as, for lack of funding, no new programs are produced of Schickele Mix) Robert R. Reilly (RRR) notes his objection to Schickele Mix's mantra that "all music is created equal," which he continues to expose as nonsense by asking the highly rhetorical questions: "Is all poetry equal? Is a bottle of Thunderbird equal to a 1987 Caymus Reserve Cabernet Sauvignon? Is 'Who Let the Dogs Out?' on the same plane as a Mozart aria?" Perhaps there is a kinder way to treat Schickele's statement. The proposition is that music ought to be qualitatively judged not by genre, but by where it stands within its genre. "All music is created equal" is not, to play with analogies, to say "all apples are created equal"—which is indeed nonsense; just look at the innate superiority of the Granny Smith!—but instead "that all FRUIT is created equal." Thus the question of whether strawberries were on the same plane as watermelons seems as silly as it probably deserves to be. One ought not to compare Mozart to Wagner or Wagner to Cage or Cage to Ligeti, and so forth, much less Mozart to Snoop Dogg or Diana Krall or Led Zeppelin. It would be not so much "unfair" (though, perhaps, that too!) but again: silly. The enjoyment gifted to us by—or garnered from—Mozart cannot be the same as that which we derive from Wagner or Ligeti or Duke Ellington. It may be equal for some in intensity, but it is not the same. "All music is created equal" is not tantamount to saying that all music is the same (or even of equal quality). Hence, the same measure of beauty is grossly inadequate. Perhaps the joy from Cage's music can never be as intense as the joy from Mozart's pieces. This may be true for most listeners—and it is true for many reasons, intent not being the least among them—alas, they have value on their own grounds, if only in my opinion. In part I think that this way of thinking of music might be reflected by the actual quote with which Schickele Mix used to open, namely that it was a show dedicated to the proposition that "all musicS ARE created equal!" In RRR’s discussion on Nielsen he makes a comment along these lines: "This makes a dramatic, but not musical point." Unfortunately, he continues calling it a "miscalculation." Quite frankly, I do not understand why. Is music not supposed to be about more than merely music? L'Art pour l'art? I find nothing wrong with that; indeed, I may well expect it from art to make a point that is not part of its essence. If that were the case, art would become a warped meta-communication about art; a chain of self-referential statements. If applied to films, this would mean that there would be no good cinema aside from 8 ½ or State and Main. I specifically want art to make statements. Afterwards, I may judge the statement to have been transmitted successfully or not, or perhaps so much at the cost of the art itself, that I do not value it for much besides the statement. Perhaps a piece of music is less a movie under such circumstances, but rather a documentary. But I will listen with great interest to such documentaries, even if they are titled String Quartet for the End of Time.These are just two of some of the qualms and reflections that occurred for me when reading the book. They happen to be qualms rather than delight, but that is, if anything, coincidence. For example, I enjoyed this sentence: "Anyone who enjoys Britten's music of this kind should likewise appreciate Mathias's" (p. 144). Indeed telling of the nonchalance with which he treats the breadth of his appreciation of modern music, while I imagine the greater part of his initial readership to wince even at the very idea of Britten, assuming that they know him or his work. I remember now a gentleman who introduced him and RRR's then-still-absent book mentioning Mahler's songs as though he had bitten into a lemon. "...should likewise appreciate Mathias's..."
His passion for Janáček's string quartets is so palpable that not having a copy at home must seem half a crime. His championing of Saeverrud (my initial reaction, too, was: Who???) is passionate and sophisticated. 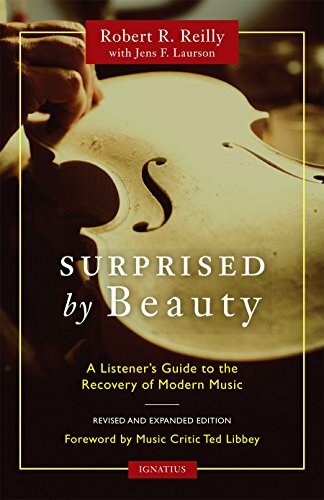 A book, in short, that will get much and repeated bedside reading and the occasional study: a charming companion through 20th-century classical music with amiably strong, if not always agreeable, opinions. Robert R. Reilly's writings on ionarts can be read here. A second, considerably expanded and updated edition of Surprised by Beauty is slated to appear from Ignatius Press. are all fruits indeed created equal? sure, strawberries and melons may be on the same plane; but the experience of the tropical fruit market (like the one here in Chiang Mai) teaches that there are rather not so accomplished types of fruit. for example, there is something called Dragon Fruit which looks amazing but has no taste at all. but it is dramatic, beautiful, and cheap, so it sells. perhaps some of these fuits, given a few hundred years of horticulture, can be bred into varieties which are as delicious as today's mangoes, but right now they are little more than a valiant new entrant, a hopeful rather than a great. OK, analogies are imperfect anyway. but do you *honestly* believe that rock-and-roll or heavy metal or even jazz as genres are/can be remotely comparable to the classical style of composition (Mozart, Haydn) or renaissance polyphonic masses? (never mind that there are no arguments one way or another, i am asking for a statement of honestly held belief).